Sambucus nigra is a shrub or low tree (7 m) with a trunk diameter of 30 cm and a rounded crown, with fissured bark is ash-brown color (from an old trunk elderberry bark can be gray-brown), with a large number of yellow lenticels on the young branches. Elderberry live to 60 years. In folk medicine, used elder flowers, berries, bark, and sometimes of the kidneys. Flowers should be gathered in dry weather, during the full flowering elderberry (may - June). Berries are harvested only when fully Mature, i.e. until the end of August – beginning of September. Bark black elderberry it is important to gather before the start of the period of SAP flow. 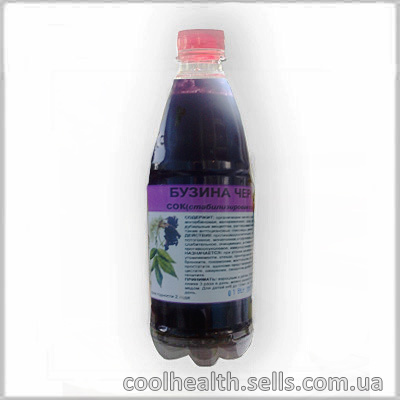 The elderberry must be distinguished from herbaceous elderberry and red elderberry, which are not used in official medicine, although their use is possible in folk medicine. The flowers of Sambucus nigra are collected in corymbose brush diameter to 20 cm with 5 main axes, falling after flowering. Red elderberry brush egg-shaped with a diameter of 6 cm, does not fall after flowering and herbaceous elderberry flowers are collected in corymbose brush with 3 main axes. Different and the flowering time of these plants: first, red elderberry blooms (usually in may), then Sambucus nigra (June – July), and the last elder grassy (in July). The black elderberry flowers yellowish-white, and red elderberry – green. The berries of the black elderberry purple-black, the elder grassy – black, and red elderberry bright red. The Black Elderberry Juice composition. The Juice of the Black Elderberry properties. The Juice of the Black Elderberry use. The Juice of the Black Elderberry contraindications. It is strictly forbidden to eat the berries and decoctions of elderberry during pregnancy and breast feeding. Also, children under the age of twelve treatment with the help of an elder may be appointed by the physician and performed under his strict control. Dose of usage: adults and children over 12 years - 1 teaspoon 3 times a day (dissolve in 1 cup of warm water with honey). For children 6 to 12 years - 1 dessert spoon 3 times a day.